Denny Hamlin celebrates in victory lane after winning the NASCAR Sprint Cup Series Sprint Unlimited at Daytona International Speedway. Denny Hamlin won Saturday’s bizarre and wreck-marred Sprint Unlimited at Daytona International Speedway, the kick-off event to the 2014 NASCAR Sprint Cup season. 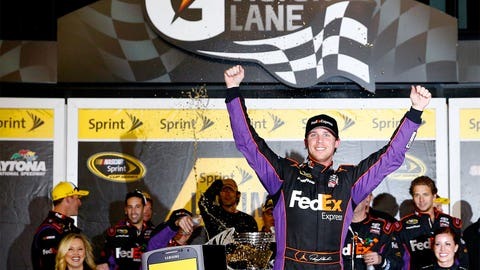 Hamlin dominated the night in his Joe Gibbs Racing Toyota, leading six times for 27 laps, to win over the Penske Racing Ford of Brad Keselowski and JGR teammate Kyle Busch. Joey Logano was fourth in a second Penske entry, while Kevin Harvick completed the top five in his competition behind the wheel of his Stewart-Haas Racing Chevrolet. It was Hamlin’s second victory in the event, the first coming as a rookie in 2006. "The best car won, that’s for sure,” said Hamlin. "… We had a great car all weekend." Hamlin, who missed four races with a broken back last year, said he’s hoping to use the victory to rebound from last year’s disappointments. "It’s a great win," said Hamlin. "You love starting Speedweeks like this. In 2006, it kind of spring-boarded my career into a great year. (In) 2009, winning Homestead spring-boarded us into a great 2010 and a championship run. There’s no negatives that come out of a day like today." Third-place finisher Busch was definitely impressed by his teammate’s winning effort. "Denny is on a mission, man," Busch said. “… He’s on fire right now. He’s good. He’s fast. He’s ready." Run under a full moon in central Florida, the 75-lap battle was one of the strangest races in recent memory, with less than half the field going the full – and short – distance and the pace car catching fire on track prior to the final 20-lap third segment of the race. A Sprint fan vote set the format for the race, with 30 laps in the first segment, 25 in the second and 20 in the last segment. Also by fan vote, the starting grid was set by practice speeds, which put Hamlin on the pole, flanked by Jamie McMurray. Hamlin won the opening segment, with six-time series champion Jimmie Johnson getting loose and crashing at the exit of Turn 4 on Lap 30, ending his race for the evening. It was Johnson’s third consecutive DNF in this event. Then on Lap 36 in the second segment, there was a nine-car accident, with Joey Logano and Matt Kenseth making contact just past the frontstretch and triggering a massive scrum behind them. Tony Stewart, in his first race back since last August, made hard contact but got out of his car under his own power, while Danica Patrick was hit hard by boyfriend Ricky Stenhouse Jr., knocking them both out of the race. "It’s just part of it," Stewart said after being released from the track’s infield care center. "We’re back at Daytona." When the race restarted on Lap 41 after an 11:25 minute red-flag period, just nine of the 18 starters were left on the track. Hamlin held off Keselowski to win the second segment. The final element of the fan vote called for a mandatory two-tire pit stop prior to the third and final segment. Hamlin came off pit road ahead and led heading into the closing 20 laps of the race. But before the field could take the green, the pace car burst into flames and had to be pulled off the track, a battery pack in the truck igniting and causing a mini-inferno. When the track finally went green, Earnhardt quickly moved to the lead. Then Kyle Busch spun to bring out a caution on Lap 60, but he held onto it and headed to the pits for fresh tires, along with teammate Hamlin. The race restarted with 12 laps to go, Logano quickly moving to the lead. On Lap 66, Earnhardt’s hopes of victory were dashed when Marcos Ambrose hooked him and put him into the wall. The green came out again with five laps to go, with Penske Racing teammates Keselowski and Logano leading. With two laps to go, Hamlin made the race-winning pass, as he charged down the bottom lane to the lead and made it stick. "That was survival of the fittest for sure," said Hamlin. "With three (laps) to go we’re at the tail end of a very small pack and it’s really hard to get runs, but this car was just phenomenal and you saw it those last couple laps." Runner-up Keselowski said there was nothing he could do at the end, especially since he didn"t have a drafting partner to push him past Hamlin. "The 11 (Hamlin) timed his run just perfectly and made the most of it," said Keselowski. "It’s the end of the race. Everybody’s taking their opportunity to win it. You can’t expect any help."